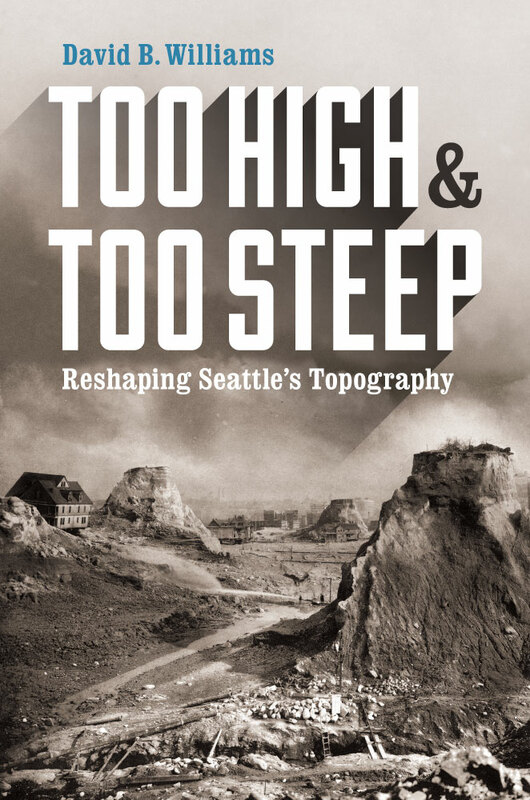 In his new book Too High and Too Steep: Reshaping Seattle’s Topography, David B. Williams tells an engaging story about the radical ways in which the leaders and inhabitants of Seattle have altered the landscape to better accommodate their visions for the city. 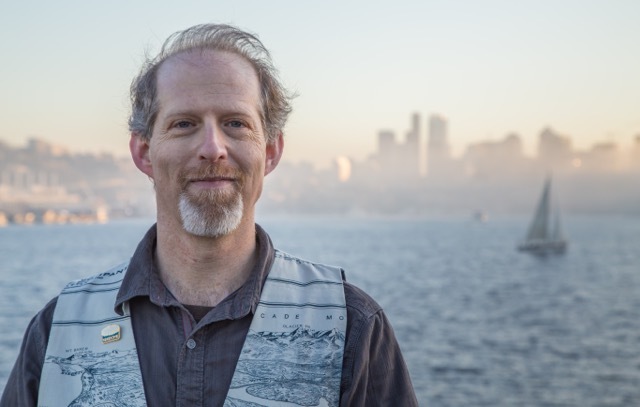 Williams uses his science and nature writing background, extensive research and interviews, and deep knowledge of Seattle to illuminate the real physical challenges and sometimes rather startling hubris of these large-scale transformations: the altering of the original shoreline and lowering of the inconvenient bluffs; the filling in of the vast tideflats at the mouth of the Duwamish to make new, flat land; the creation of the ship canal to link Puget Sound with Lake Union and Lake Washington; and the removal of millions of cubic yards of earth in order to lower Denny Hill at the north end of downtown. He also helps readers connect the landscape of today with the landscape of the past and find the visible traces of the ways the topography has been changed. Senior acquisitions editor Regan Huff spoke with Williams about the book, published this fall. Regan Huff: Topographic change is an unusual subject. What led you to it? David B. Williams: I have long been interested in Seattle and its landscape. In particular I am intrigued by how our geologic past has influenced and continues to influence the city in many ways, from where we build to how we move through the landscape to why Seattle even came into existence. Several years ago I got involved with The Waterlines Project, a Burke Museum endeavor that focuses on Seattle history through an examination of its shorelines. Working with them, I realized that the incredible story of topographic change—of regrades, tideflat filling, and waterway replumbing—had never been told in a detailed, accessible manner. As I dug deeper into the topic, I became more and more fascinated with the stories, people, and engineering and how they provided an intriguing way to tell a history of Seattle. Q: Do you see any relationships between the subject matter of your book and the current much-publicized woes of Seattle’s urban tunnel project? David B. Williams: Yes, on several levels. The first is that the problems we’ve had with groundwater and sinking buildings are due precisely to our history of altering the landscape. If the city were built on bedrock instead of a stew of fill, including sand, coal, old lumber, piles, and cinders, those concerns would not exist. Hard rock does not have the hydrology and building stability issues that are creating our present-day problems. Author David B. Williams. Photo by Andrew Croneberger. The second relationship has to do with how we view landscape. I think that altering our topography has become part of our collective DNA. So many projects took place in the past that it created the mentality that large scale engineering was the only way to deal with our challenging topography. This is certainly what we are seeing with the new tunnel, the removal of the Viaduct, and the new seawall. Each is a response to the landscape, both natural and human created. Q: You have said that one aim of your book is to help Seattle readers become better observers of their city; in other contexts you’ve expressed a lot of enthusiasm for urban walks and urban exploration. Why do you think this is important? David B. Williams: On the most basic level, getting out and exploring the city and paying attention to what one sees simply makes this a more interesting place to live. It allows one to make connections between disparate areas and ideas and also promotes a stronger connection to the place itself. By discovering these stories of the land and people, we have richer and I would argue happier lives. Research even shows that such connections make us healthier, more creative, and smarter. In addition, by getting to know the city more intimately, we are better able to understand the issues it faces, whether it’s salmon in our streams, troubles with tunnels, or too many geese. For instance, consider the recent news about sinking buildings. Walk around Pioneer Square and you cannot help but notice that there is something odd underfoot. Tilting sidewalks, buckling streets, and below grade sinking foundations all point to the fact that the city has been settling long before Bertha. That does not mean that the tunnel is not problematic, but that it is not the lone issue challenging the engineers. Q: Did you come away from your research admiring or questioning the hubris of Seattle’s past efforts to change the urban landscape? David B. Williams: It’s hard not to be both amazed and flabbergasted by our predecessor’s projects. None of the large-scale changes I write about could take place today. We have too many regulations and too many people who would protest. Back in the day, all it took was a person with an idea and the ability to raise money and the project could begin. Nor can we even fathom the scale of these projects. Filling the tideflats, cutting down hills, and rejiggering lakes were epic, landscape-scale changes with profound consequences economically and ecologically. Nothing taking place at present compares. I am not saying that I approve of the projects but I cannot condemn them either. The people who undertook them truly believed that they were making Seattle a better place to live. Yes, they often benefited financially, but that was not typically what drove them. You have to remember that these endeavors were undertaken when Seattle was not the hip, trendy, financially successful place it is now. It was a relatively small city, or even a town, on the edge of the continent. These projects developed because their proponents often thought they had no other choice; in their minds, these projects were essential for growing and developing the city’s business and industry. Without them, Seattle would not survive. This entry was posted in Environmental History, History, Nature, Pacific Northwest, Q&A, Western History and tagged Northwest Writers Fund, Pacific Northwest, Q&A, Seattle, urban history on September 23, 2015 by uwpressblog.